This extraordinary terroir, now exploited by Edouard Moueix, the son of Christian, seems to be coming to life in a dramatic fashion. Never a hedonistic wine, but very intellectual, the 2009 suggests a liqueur of crushed rocks intermixed with black currants and black cherries. Still somewhat closed, medium to full-bodied, and impressive rather than seductive, this is a structured wine that needs to be forgotten for at least a decade, and then drunk over the following 30+ years. If readers are looking for the quintessential example of a terroir-dominated wine, this is Lesson 101 in terroir. Christian Moueix and his son, Edouard, must be extraordinarily proud of what they have achieved in just a few years after taking over this property (previously known as Belair) that had been so mismanaged and underexploited by its previous owners. Yields were cut to 13 hectoliters per hectare in 2009, and this great terroir has finally revealed its true potential. Tasting like a liqueur of crushed rocks intermixed with raspberry jam and kirsch, the full-bodied, elegant 2009 is a quintessential example of a true terroir wine. Forget it for 5-7 years and drink it over the following three decades. (Tasted once.) Drink 2015-2045. Robert Parker added an asterisk to this wine score to signify that it is a wine he considers has the finest potential of all the offerings he has ever tasted from this estate in nearly 32 years of barrel tasting samples in Bordeaux. Tasted at JP Moueix. There is a slight exotic touch to the aromatics of this Belair-Monange, candied red-berried fruits, a touch of orange-zest, apricot and dried honey. Well-defined, expanding with aeration with hints of vanilla essence. The palate is medium-bodied, very tight at the moment with firm tannins, quite compact and reticent, but there is certainly a sense of coiled-up energy towards the finish. Hopefully, it will be more expressive after bottling. Tasted March 2010. Delivers intense blueberry and blackberry, with hints of dark chocolate. Medium- to full-bodied, showing firm, silky tannins and a long, flavorful finish. Precise fruit. Racy, ripe tannins. Formerly Belair, and much better quality. Light to mid crimson. Ripe cherries and minerals on the nose. Very fresh and delicate. A really light hand on the tiller here. Enough substance but very far from a fruit bomb. Interesting chalky texture on the finish. Date tasted 30th March 2010. Drink 2016-2030. 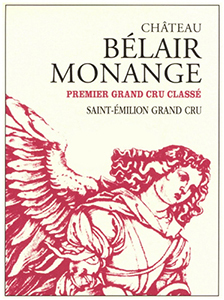 Chateau Belair is now owned by the Moueix family of Petrus fame, and has a new name. This is one of the greatest vineyards in Saint Emilion, perched at the top of the slope right next to Ausone. Despite the brilliant terroir, the wine-making here had been mediocre for many years. It is clear that Edouard Moueix is going to transform this Chateau into one of the stars of Saint Emilion. This combines flesh and richness with bright acidity. Silky and harmonious. Beautiful balance here and great length. At first taste it doesn't seem to be big but it lingers on palate with a very long finish. Impresssive. 90% Merlot, 10% Cabernet Franc in the blend. A miniscule yield of 13.75 hl/ha from vines as old as 100 years. 1000 cases will be produced. Greater density and definition than in the past. A more modern feel. Lovely fruit, refined texture and still the freshness and length provided by the terroir. Drink 2018-2040.